TBTI is calling for contributions for an upcoming “photo e-book” publication on “The meaning of small: Diverse values of small-scale fisheries”. This volume is coordinated by TBTI the TBTI 'Diverse SSF Values' research cluster, which advocates for better understanding and enhanced knowledge about the importance of small-scale fisheries and their various contributions to the society. Through the study of values, we will gain appreciation for what matters to the people and what is desirable to society. Further, understanding what these values are, how they differ between different regions, and how they influence decisions can lead to better natural resource arrangements. 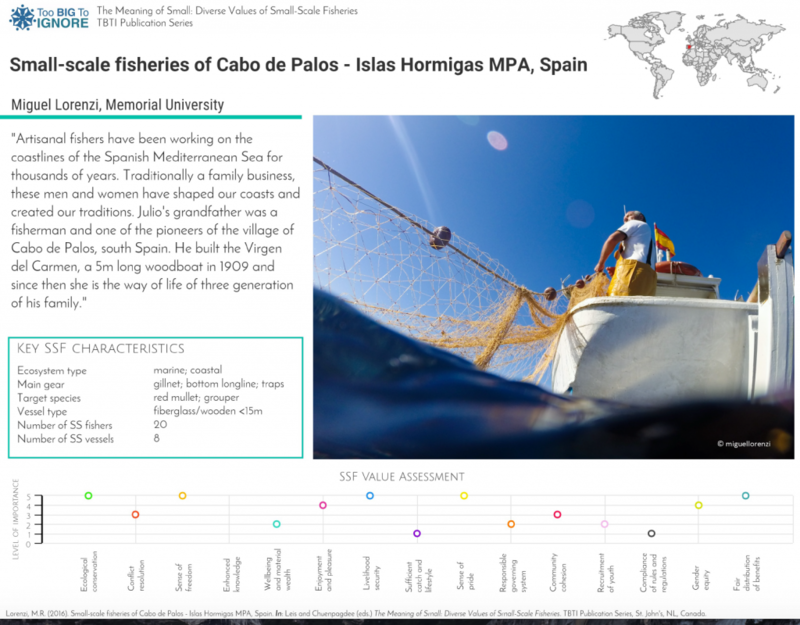 TBTI aims to portray this plethora of core values through the e-book publication by using visual stimuli such as infographs and photos to convey what small-scale fisheries mean in particular places. We developed a rapid assessment survey to help capture the range of values, based on the scheme suggested by Song and Chuenpagdee (2015). Click here for an example of a chapter in the publication. If you are interested in becoming one of the authors of our photo e-book, please send: (1) a high resolution photo that captures the value of SSF in your study location, along with a short caption (no more than 50 words); (2) a brief description of your case study (no more than 100 words), including name, location, type of fisheries, and key issues and challenges; (3) the completed rapid assessment form available here. Please send your contribution to Mirella de Oliveira Leis, TBTI Research Assistant, at mirella.deoliveiraleis@mun.ca no later than December 15th, 2016. Make sure to include author(s), affiliation of each author, and email address of the corresponding author. Submission prior to November 15th will be included in a special presentation at the World Fisheries Day event held at Memorial University of Newfoundland, in St. John’s, Canada. For more information about the e-book, download the call for contributions.